The problem with a BLT, my friend Neil opined, is that there’s always too much bread and not enough bacon. This was why one Sunday morning last spring he served us BLT tacos for brunch. It was set out taco-bar style. There was a platter of crisp brown bacon, some romaine lettuce and sliced tomatoes, and a soft towel filled with warmed corn tortillas. Best of all, instead of using plain mayonnaise, he spiked his version with vinegary Cholula hot sauce — a bright orange condiment to slather over everything. Not only were these BLTs lighter than the usual sandwich, they also had a far more exciting texture. Without the bread slices smothering the shatter and snap of bacon and lettuce, there’s a lot more crunch. My version stays pretty close to his, though I did gussy up the tomatoes a bit, dicing them into a salsa with lime juice, cilantro and jalapeño. 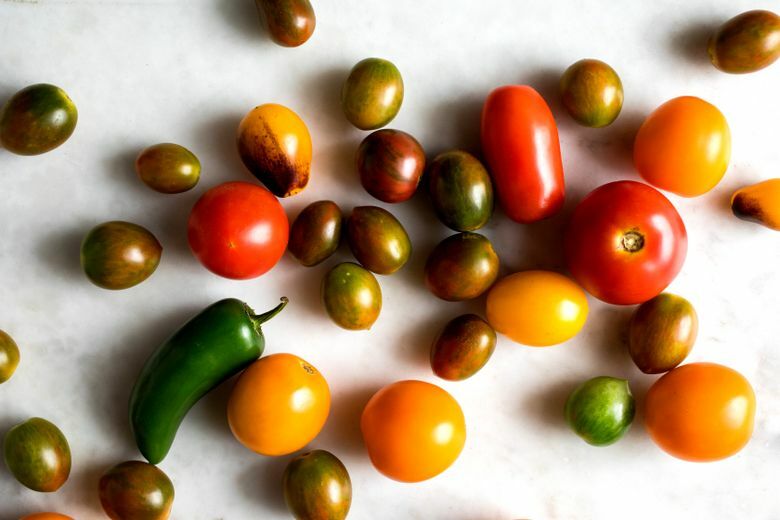 But if it seems like one too many things to chop on a weeknight (or weekend morning), skip it and slice up a ripe tomatoes instead. Another minor deviation: I also added avocado to the tacos for creaminess. But if you can’t get a good one, leave it out. 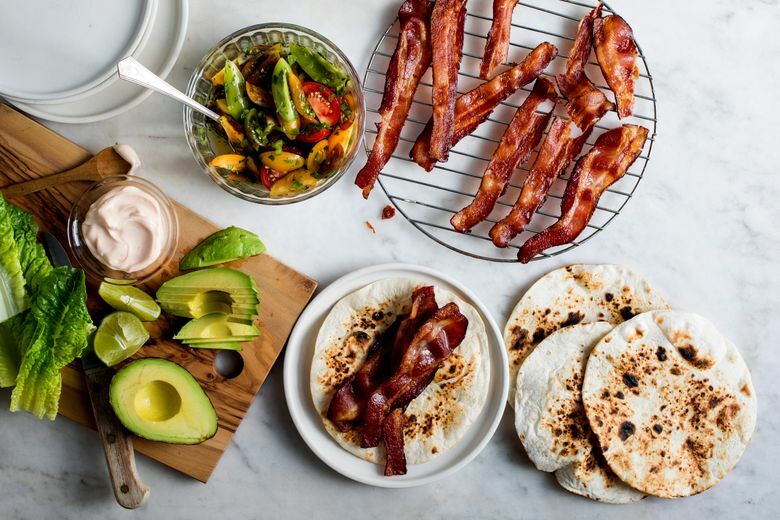 The bacon, however, is nonnegotiable in any BLT, taco or otherwise. 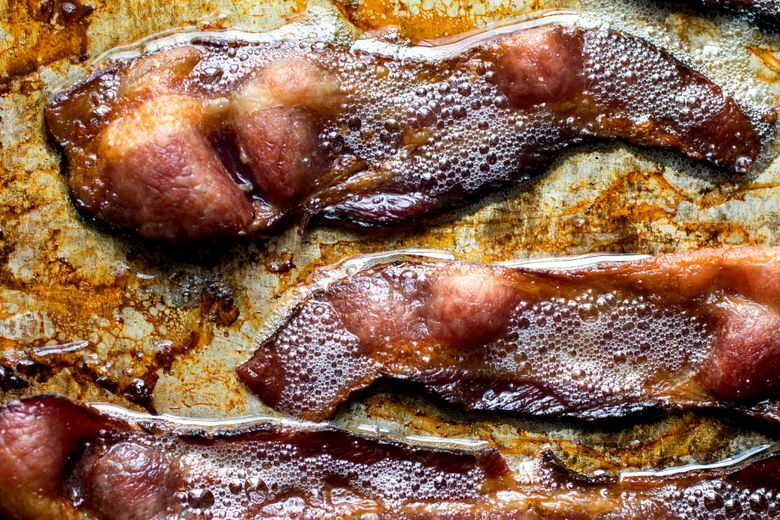 I like cooking my bacon spread out on a rimmed sheet pan in the oven because I can do a lot of it all at once, and I don’t have to stand over it like when it’s frying. Also, all that splattering bacon grease stays behind the closed oven door, where I can pretend it doesn’t exist. While the bacon bakes, you can make the salsa (or slice the tomatoes), cut up the avocado and mix the spicy mayonnaise. I like the vinegary sharpness of Cholula hot sauce here, but Tabasco and Crystal are two other good bets. Just stay away from sriracha, which is slightly sweeter than what you’d want for this particular combination. Just before serving, warm the tortillas. If you’ve got a gas burner, you’ll be able to get a little char on them. Or warm them individually in a dry skillet. Either way, be sure to wrap them in a kitchen towel to keep in the heat. All told, it’s dinner in under 30 minutes — or an unexpected but still bacon-filled brunch. 1. Heat oven to 400 degrees. Lay bacon in an even layer on a rimmed baking sheet, and bake until browned and crisp, 15 to 20 minutes. Transfer to a paper towel-lined plate and let cool. 2. While bacon is cooking, toss together tomatoes, jalapeño, cilantro, lime juice and a large pinch of salt in a medium bowl. Taste and add more lime juice and salt, if needed. 3. In a small bowl, whisk together mayonnaise and hot sauce. 4. Lay a clean kitchen towel in a medium bowl. Using the open flame from a stovetop gas burner (or in a skillet placed on an electric burner), warm and lightly char tortillas, 30 seconds to 1 minute per side. Transfer warmed tortillas to a towel-lined bowl, and cover with towel to keep warm while you finish remaining tortillas. 5. 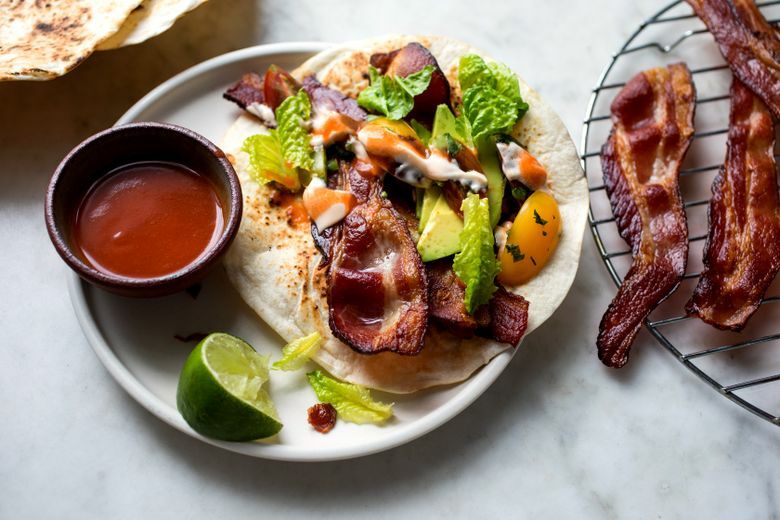 Serve, letting people make their own tacos by layering bacon, salsa, lettuce, spicy mayonnaise and avocado, if using, on tortillas. Top with more hot sauce, if desired.